Joe Dodge Lodge, in the heart of Pinkham Notch, is surrounded by White Mountain National Forest and is home to some of best the outdoor adventures in the region. Hike Mount Washington – New England’s tallest peak – from our front door. Ski Tuckerman Ravine, the slope of backcountry ski legend. Or mountain bike nearby trail networks, such as Great Glen Trails. Start your day with a hearty breakfast, then venture outside to explore the Great Gulf Wilderness or head straight for the summits. In the evening, a delicious, home-cooked dinner and comfortable bed or bunk will help you refuel and recharge to do it all over again tomorrow. Open year-round, Joe Dodge Lodge at Pinkham Notch offers a variety of accommodation options for our guests, including private rooms and bunkrooms with hallway bath. Towels, linens and soap are provided to all guests. Dinner and breakfast are included in most room packages. Additionally, for a reasonable price, robust and healthy trail lunches are available at the Visitor Center. Guests can also enjoy a wide variety of free, walk-on programs, from guided day hikes to evening talks on astronomy and other topics. The lodge is wheelchair-accessible, including bathrooms and showers, as is the Visitors Center gift shop and dining hall. Dinner and breakfast are included in most room packages. Robust and healthy trail lunches are available for purchase in the Visitor Center. For your convenience, orders can be placed the night before pickup. Complimentary coffee is served every morning in the dining hall. Breakfast: Served buffet-style from 6:30 a.m.-9:00 a.m. Please notify AMC Reservations if you have food allergies or any other dietary restrictions. Put your feet up and enjoy Joe Dodge Lodge’s comfortable living room with cozy fireplace, or enjoy a quiet book by the fire in our sunny library. Guests can also make use of our Hiker Shuttle to nearby trailheads (summer and fall), new Electric Vehicle (EV) Charging Station, and Wi-Fi Service. Families will love our Children’s Discovery Room, complete with natural history resources, books, and games. Our Demo Center offers guests the opportunity to try out LOWA boots, LEKI hiking poles, and Hillsound winter traction for free. Guests who test the demo gear will receive a discount to purchase the same or similar model (except for boots) at our Pinkham Notch Visitors Center store. Our retail store offers books, maps, logo gear, USFS parking passes, and last minute items. The friendly staff is always available to assist with weather, trail conditions, and other information. We are not able to accommodate pets at Joe Dodge Lodge. Please ask for our list of local kennels. Please be respectful of other guests and observe quiet hours from 10:00 p.m. to 6:00 a.m.
Alcoholic beverages are allowed in the lodge and dining room in moderation and should be consumed in a responsible manner. At Joe Dodge Lodge, in the heart of Pinkham Notch, hiking, mountain biking, skiing, and climbing are just a few of your choices. Whatever your appetite for outdoor adventure, you’re likely to find it here. Not for the faint of heart, Mount Washington’s elevation of 6,288 feet, challenging ascent, and sweeping views make for an epic journey. Hike up and ski down the legendary backcountry ravine this spring. Or watch the springtime ritual from Lunch Rocks at the ravine’s base. Join one of our Family Adventure Camps and start creating memories. Our trained guides will lead you on a variety of fun outdoor activities. 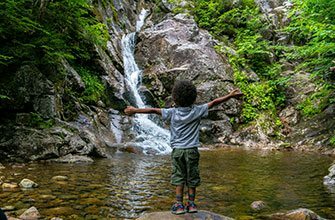 Our Pinkham Notch adventure guides offer free programs including short hikes and nature walks, talks about local flora and fauna, and evening speakers and movies. View a sample schedule. The right clothing and gear are essential in the unpredictable weather of the Northeast’s mountains. Even if it feels like summer in the valleys, it can be cold and winter-like on the high peaks, especially once the sun goes down. Use our gear guides to make sure you’re packing everything you need for comfort and safety. AMC’s Hiker Shuttle connects the Highland Center, Pinkham Notch Visitor Center, and the towns of Lincoln and Gorham with major trails to the huts, allowing hikers to start and end their trip at different points. The stop in the town of Lincoln is coordinated with Concord Coach bus service. Hiker Shuttle runs daily for most of the full-service hut season, from early June to mid-September. The shuttle operates on weekends only from mid-September to mid-October. Reservations are strongly recommended. View a complete schedule. Visitor Center open until 9 p.m.